7 Things To Consider Before Buying a Dollhouse! There’s nothing quite like a dollhouse. Apart from their obvious beauty and glamour, they also encourage children to use their imaginations, and can keep the little ones entertained for years to come! 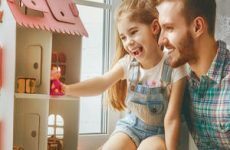 There are some important things to consider when looking for the perfect doll house for your family, so let’s look at a few to help your decision-making become a little clearer. The great thing about playing with a doll house is that it encourages friends and siblings to share with each other and learn to play together. However, not ever dollhouse is suitable for all ages. So when searching for a dollhouse for your children, consider their ages. This is especially the case when it comes to finding the best dollhouse for toddler ages. If your children are under the age of 3 years, then you may find that some doll houses have small pieces posing a choking hazard. The Fisher-Price range have some great starter dollhouses for toddlers. Some are gender-friendly meaning the boys don’t need to miss out on all the fun! Most are made from durable plastic making them tough and easy to clean. People may think that doll houses are only for younger children, but now-a-days there are many modern dollhouses that are designed with pre-teens and even teenagers in mind! That equates to many years of fun, memories and play, making the dollhouse excellent value for money. When searching for the perfect dollhouse, longevity is definitely worth considering. Before you run out to buy a dollhouse, size matters. Where are you going to put it? Do you want a life sized-dollhouse, or a miniature one? Will a big doll house leave enough room for your family to live and move around in, or will it take up too much space and become a nuisance? Also, where will you put the doll house? Will it be placed inside the child’s room or in a common area like a finished basement? If you have a dedicated space, then there is a wide range of doll house sizes to choose from. The size of the doll house affects which dolls the kids can play with. Some are built to accommodate the larger 18 inch dolls, others only fit the small ones. If you have a young toddler, they can be a little rough on toys when playing. Choose a dollhouse than can take a beating, and watch for removable parts than can be a choking hazard. One made of hard plastic could be a good option to begin with. They are generally nice and bright, easy to clean, have fixed parts, and don’t have sharp edges. Keep in mind that the best dollhouse for toddlers is one that is extremely durable. The most common dollhouses come in either wood or plastic. And each material has its own advantages and disadvantages. Plastic dollhouses are extremely easy to clean and disinfect, have soft corners and can with-stand a lot of rough play. Great for the young toddlers. Wooden doll houses are more environmentally friendly, come in a huge range of sizes, are built to last, and a generally the choice for kids over 3 years. The KidKraft dollhouses and Melissa and Doug dollhouses are mostly wooden. The doll house material you choose will depend on your personal preference, child’s age, cost and specific needs. Dollhouse Cost – What’s Your Budget? Do you want the best dollhouse ever with all the bells and whistles that is likely to last your family for years to come? Or are you on a tight budget needing to look for a cheap doll house? You could consider buying one second-hand. There are online sites that offer doll houses for sale, or you may even find one in your local neighborhood. For the entertainment they provide, dollhouses are great value for money, and luckily there is such a huge range with price-tags to suit every budget. How handy are you? Up for a challenge? Another option is to make it yourself. You can purchase doll house kits and make it a DIY project. Many dollhouses come some furniture and accessories, and there are always plenty more to buy to keep the little house “fresh” and exciting. In most cases the dolls need to be purchases separately, with a range of sizes and styles available. Make Your Own Dollhouse or Buy An Assembled Dollhouse? Now that you have an idea of the size, material, price range and special buying options, another consideration is, to buy an assembled dollhouse, or build it yourself. You can purchase doll house kits with the instructions to follow along. If you are handy, have some basic tools and are up for a challenge, then consider a dollhouse kit. Some even offer furniture kits. Dollhouse kits are usually much cheaper than assembled dollhouses and enable you to customize it to your taste. Choosing paint and or wallpaper can be a fun, hands-on, family-bonding project. Dollhouses are such a fun idea and can be a great way for your child to develop their imagination, social skills, role play, or simply have some quiet play time. However, there is a lot to consider when buying one for the first time, and I hope this article has made the decision process a little easier. To take a look at some of our most popular and best-selling dollhouses click here.